Politicians and their supporters from different parties recently defied their party colours and came together in favour of environmental cleaning exercise locally known as “set setal” around Manjai Kunda Market. The cleaning exercise which was sponsored by a Gambian American, Lamin Keita under the leadership of Hon Madi M.K.Ceesay, the Sere Kunda West UDP Assembly Member, for the first time attracted the APRC Councillor Tombong Jatta and the PDOIS candidate in the last council election along with their respective militants to join forces and embark on the cleaning exercise of the market. Mr. Keita handed over ten thousand dalasi (D1O, 000) to Hon. Ceesay the National Assembly Member of the area towards the market cleaning exercise. Speaking at the gathering, Mr. Keita said he was proud to be associated with such a wonderful exercise as he could see that Gambian politicians have put politics aside and were working for the development of the country. This, he said, was worth commending as it was the only right way to forge ahead. Mr. Keita expressed pleasure in supporting the exercise which he called was his contribution towards national development. For his part, Deputy Mayor of KMC, Musa Bah also said that it was a great pleasure to witness such kind of occasion which promoted healthy politics and good governance within Gambian society. However, he congratulated the MP for Serekunda West, Hon. 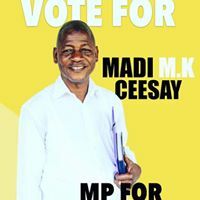 Madi M K Ceesay for organizing such an exercise. “I hope this kind of initiative will be spread to many other areas within the KMC”, he concluded. Other speakers included Tophie Kanuteh, the UDP Constituency Chairman of Serekunda West who commended the youth and the development committee for spearheading the exercise and the massive turnout. He thanked supporters of other political parties who despite their political differences fully participated in the exercise as a result of the love they have for their country. Nfamara Jarju, the Chairman of the Constituency Development Committee headed operations during the whole exercise. Previous articleGambia /Algeria Match What Went Wrong?